buffo-buten : who is BUFFO ? Have a chance to see Howard BUTEN, the clown BUFFO on his tour 2006/2007, click on "tour at this time of the year" . Howard BUTEN does it all. He sings, dances, plays the cello, the trumpet... You name it, he’ll make you laugh and cry doing it. The creator and sole-performer of “Buffo”, he is also a best-selling author (“When I was five, I killed myself”, among others) and works with autistic children. An American who has found a new home in France. Howard BUTEN tours “ Buffo” frequently in major European cities and many African countries. It’s a show which is at once impossible to categorize and universally appealing. Here is a clown who is, in spite of the usual trappings (over-large shoes, checkered hanky, red nose), like no other clown. The gags seem to emerge lightly, all by themselves, like a stream of memories. Without a world, the masterful mine and ventriloquist fascinates and capti-ures the heart of any audience. One of the actors is a violinist known the world over. The other is a clown different from any you have ever seen. One creates a wealth of exquisite sounds and harmonies, the other a concentration of pure emotions. The virtuoso with the violin : Pierre Amoyal ; the clown and violin enthusiast : Howard Buten, otherwise known as Buffo.
" Sonata for Violin and a Red Nose" is a dialogue without words, held between two characters that are very different, but who complement each other extremely well. They are each animated by the same sensitivity, the same tenderness, and the same sense of humor, in perfect harmony with their violins. The show begins as if it were a normal classical music concert, with Pierre Amoyal playing his violin and Frederic Chiu at the piano. Music lovers in the audience would be happy to continue listening to the concert, and when Buffo appears on stage, some in the audience may have misgivings. He arrives filled with good intentions, on tiptoes - not an easy thing to do in his big clown shoes. What comes next proves that the violinist and the clown can both be on the same stage when it comes to a musical affair of the heart. The humorous aspects of the show do not take away from the music, but instead add additional human qualities. 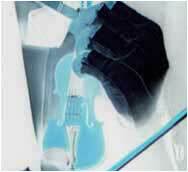 And at no time does the audience forget that the violinist is a true virtuoso. In each of the 28 pieces which make up the musical mosaic, Pierre Amoyal creates a tour de force as he moves deftly from Mozart to Schoenberg. Buffo's performance is quite different, but it proves that some clowns are in fact musicians. Both share their love for beautiful music, and a desire to break through people's preconceptions. As Buffo often makes clear, appearances can be deceiving. The results of their efforts are a true reflection of Amoyal and Buffo - generous and filled with joy, creating a veritable "Symphony in Clown Major." This is a very poetic performance, a magical meeting between two artists who share their love for the universal language of music.When the show is over, Buffo will dust off his red nose to devote his time once again to autistic children. And Pierre Amoyal, with his Stradivarius tucked under his chin, will return to the world of classical music.